Syracuse center Paschal Chukwu goes up for a rebound. Mandatory Photo Credit: Kicia Sears, The Juice Online. JIM STECHSCHULTE: Round of 32. Baylor plays a less aggressive 2-3 zone than SU, creating fewer steals and turnovers. The Bears have four good three-point shooters, but lost their best interior player, Tristan Clark, to a season-ending injury in January. Speaking of losing, Baylor has dropped seven of 11 games, including their last four. Last year, Syracuse stifled a strong perimeter-shooting TCU team in the round of 64 and scratched out a win. The lack of an inside threat will help the Orange stick to the Bears’ perimeter weapons and do it again. Gonzaga has a couple hammers inside in Rui Hachimura and Brandon Clarke, pairing them with three strong 3-point shooters. While they don’t shoot a ton of threes, the Zags lead the nation in field goal shooting and 2-point field goal shooting. Paired with a solid defense, that should be enough to pull out a win over the Orange (but I wouldn’t be surprised to see SU to pull it out, as they are 11-3 in NCAA Tourney games with one or two days to prepare since winning the title in 2003). 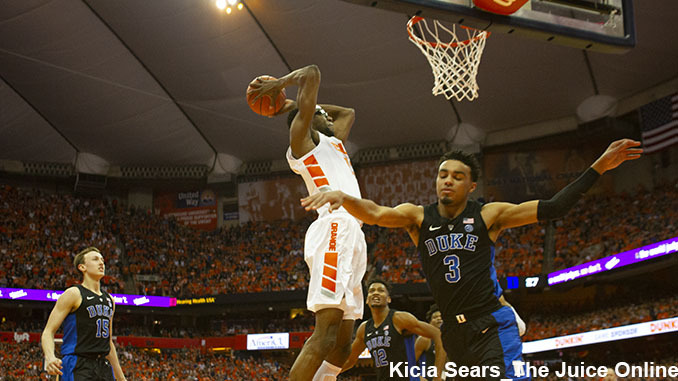 Hidden key for the Orange: Tyus Battle’s recent absence may have helped the Orange learn how other players function best on offense and could help SU perform better on that end of the floor with Battle back in action. ANDREW KOUWE: Round of 32. Baylor lost Tristan Clark in January after a knee injury. At the time, he was the team’s second leading scorer at 14.6 ppg and second leading rebounder at 6.3 rpg. The Bears could’ve really used him down the stretch when they lost their last four games to limp into the NCAA Tournament. It’s a good first round matchup for Syracuse. We practice a lot of zone because that’s what we play. Syracuse head coach Jim Boeheim will probably make a few adjustments to get ready for Baylor’s zone since it’s more of a 1-1-3, but we know where to attack the zone and we’re not going to get caught off guard by it. We’ve had pretty good success over the years against the Big 12, especially my year in 2003, the year we won it. You could say we were crowned Big 12 Champions, so I see Syracuse moving on. Gonzaga is not a matchup I wanted prior to Selection Sunday. Gonzaga has two really good big guys in Rui Hachimura and Brandon Clarke. They’re active. They’re smart. They can be problematic to our zone to have two really big guys that can score like that. I see Syracuse going out to the Zags in the second round. WES CHENG: Round of 32. There’s going to be a lot of talk about how this game will be a battle of the zones, but make no mistake about it: Syracuse does their zone better. The Orange finished 24th in defensive efficiency according to KenPom, allowing an adjusted 93.9 points per 100 possessions. Meanwhile, Baylor was rated at a more pedestrian 98.2, which was 75th in the nation. The Bears defense is more about dictating tempo than turnovers. Syracuse generates 8.27 steals per game while Baylor is more than two steals behind at 6.13 spg. The loss of Tristan Clark in January robbed the Bears of their best interior defender, and I see Syracuse grinding out a win to move on to the second round. That’s where the magic will end. Gonzaga remains the only team to have defeated Duke with a completely healthy roster, and has both the offensive punch and the defensive prowess to frustrate Syracuse. The Bulldogs are tops in the NCAA in the KenPom offensive efficiency rate, generating 125.1 points per 100 possessions, while their defense is not to shabby either. The Zags are 16th in the country with an adjusted defensive efficiency of 92.3. I think it will be a closer game than most expect because Gonzaga isn’t used to playing a zone like SU’s, and will be on a short turnaround. That said, I think Syracuse gets knocked out in the second round. Throw in another loss to fully-manned Duke in the ACC Tournament after holding off Pittsburgh’s upset aspirations, and it resulted in the meeting with Baylor Thursday night in an “8/9” NCAA first round game in Salt Lake City (9:57 p.m. ET approximately / truTV) for the right to meet the final member of the quartet of regional No. 1 seeds that SU has yet to face, Gonzaga in a second round game. Baylor (19-13) has struggled into March dropping four straight, and seven of its last 11 games as it’s up and down shooting beyond the arc has been off mark. We figure the Orange zone will continue that trend, and with Tyus Battle back the SU offense will have enough to hold on as a late Bears rally falls short. Gonzaga (30-3) is a completely different challenge with size; speed, versatility to score and defend, and depth for top notch coach Mark Few, a longtime friend of Jim Boeheim’s. The Zags spread the court offensively and have talented big men to attack underneath, exactly SU’s weakness, so they don’t have to rely on shooting over top of the zone with short preparation time. We see a season in which Syracuse finished just outside of the monster top echelon of the ACC, and fall a game short of the previous season’s Sweet 16 run with a defeat to Gonzaga in the second round.